These are a great addition to any kitchen or play food set. They come in a very realistic egg carton. In fact it is hard to tell the difference between the toy and the real thing. The eggs are very nicely finished and look so real they would fool any chicken or Easter Bunny. 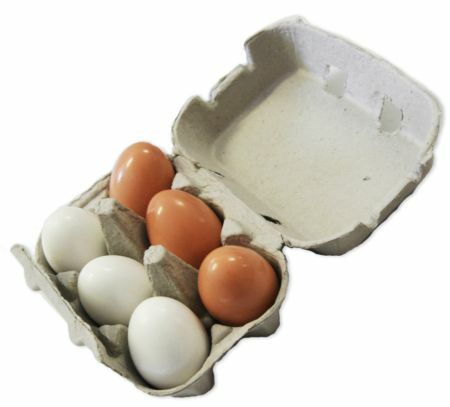 Size: Eggs are 5.5 cm high and the box is the standard size half dozen pack. Material: Wood with cardboard carton. We like this because: "Our little girl likes to put them in the fridge and play tricks."